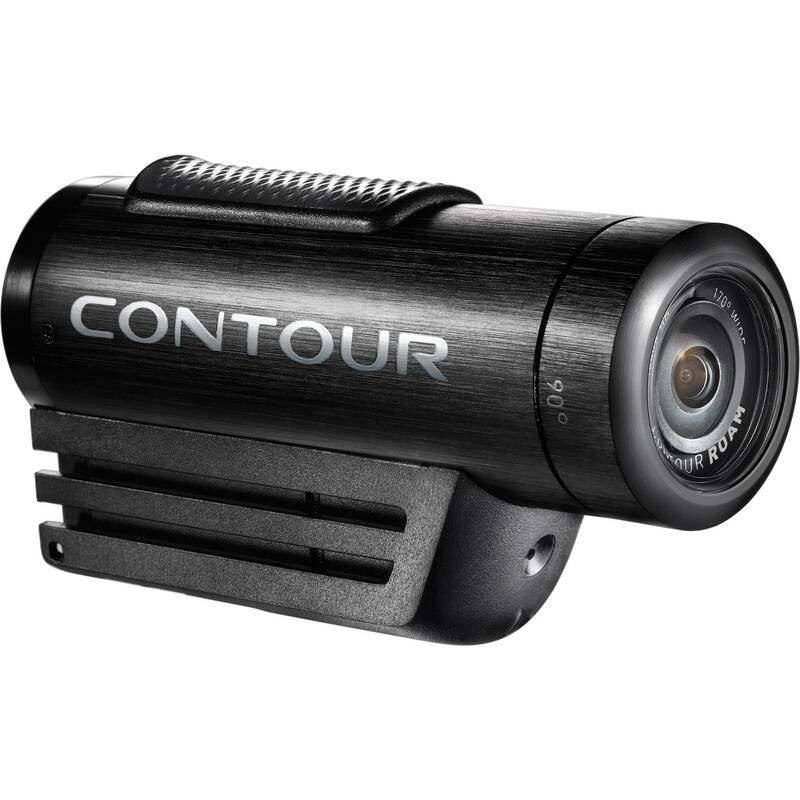 The ContourROAM Hands-Free HD Camcorder from Contour keeps things simple for capturing high-quality action video while the world is rushing past you at high speed. Flip the switch to turn on the rugged camera, and you're already recording 1080p full HD video. The rugged-bodied aluminum camcorder is impact-resistant and even waterproof to 3' (1 m), so you can find yourself helmet-down in a large puddle or small pond and maintain confidence in the integrity of your ContourROAM. The wide-angle (170° coverage) lens of the ContourROAM rotates in the body so that you can mount the camera at any angle, using either the standard tripod thread or the integrated TRail mount that plays well with all of Contour's optional accessories. Then, with the help of the ContourROAM's high-precision laser leveling, adjust the orientation of the lens to level out the horizon. The ContourROAM features an audible signal to let you know that it's recording, so there's no second-guessing. You can keep it mounted on your helmet (or surfboard, or windshield, or handlebar, or...) and have peace of mind that you're getting the shot. At only 5.1 oz with a slim, low-profile design, the ContourROAM rides along so subtly that you'll forget it's there – until it's time to offload your video and brag about your exploits. There, also, the ContourROAM shines: included software helps you upload your action-packed clips to the Internet with only one click. Box Dimensions (LxWxH) 7.0 x 5.0 x 7.0"
ContourROAM Hands-Free HD Camcorder is rated 4.5 out of 5 by 37. Rated 5 out of 5 by John W. from Great camera great standards I've only had it week or so. But been making strides in learning about it. I bought the ControuROAM which is the less expensive, simpler to operate model. It came with a lot of extra items. A really nice transparent carry case, a usb cable, a soft rubber len cover, a slightly curved permenant mount that rotates horizontally. It has a regular Tripod mount threaded hole in the bottom of the T mount under the main barrel of the camera. It also has an omnidirectional microphone under the chin. the chin of the camera also has a red stripe light that indicates when its recording. The face of the camera lens has a single laser beam which activates when you press the button on the back and scans like a Cylon from Battelstar Galactica to produce a horizontal level beam. This is so the lens with the camera can be rotated 270 degrees to level the line of capture with the line of action. There are 90 degree marks on the front barrel of the camera. The top of the camera has a slide switch which moves fore and aft. When turned on it reveals a red bulls eye target symbol that lights up to indicate its recording. Behind the bull eye, exposed even when the slider switch is in the off position are two multi colored lighted battery and sd card symbols. Green means discharging, or everything is okay. A red battery symbol means its charging. The back door of the camera was the hardest thing to figure out. There is a small vertical lever underneath the big pushbutton. The pushbutton activates the laser beam for leveling. The veritcal lever locks and unlocks the camera door, most of the time its really not necessary to lock it as the door keeps itself closed, but if it is locked you need to be sure to unlock it so you can open the rear door. There is a white dot that you can see next to the lever when it is in the locked position, and disappears when the lever is thrown and the door is in the unlocked mode. To open the door its rather unintuitive, but you grab both sides of the big round hatch and pull upwards, it offsets and clicks and then will lay down backwards away from the camera housing, it is spring loaded to hold the door open once its released. The back door has a waterproof seal to keep dirt and moisture out, its rated for about a meter under water.. but I have no plans to test it. This camera by the way includes a non-replaceable built-in rechargable battery. Which is suppose to last from 2-3 hours. Then take about 4 hours to recharge. It is possible to run the camera from a custom Car Charger meant to simultaneously power and charge the camera at the same time. Its intended for capturing car trips or something like that. A normal USB cable however is not supposed to have the wiring to simultaneously charge and record. As soon as you plug in the cable its suppose to charge and not record.. however, I'm not sure that this is correct. Its a matter of some discussion on the manufacturers community forums. One guy built a custom cable to power it off a battery pack. I've found if the camera is already recording when the USB power pack it attached by USB it keeps on recording.. and it does and the bettery indicator comes on as if it is charging.. so it might be a procedural thing. The back of the camera also has a small micro SDHC slot for up to a 32 GB memory card. And a micro USB connector port for power and recoding downloads. The camera does not come with a memory card due to some problems with bundling memory cards in foreign countries. And there is no built in storage for movie captures.. so you need to buy a memory card to get started separately. The camera defaults to capturing in 720p video in H.264 .mov file fomat, Quicktime on the Mac or PC reads it natively and has no problem with it. The camera also has other modes of capture, including 1080p and delayed snap shot mode, like 1,2,4 seconds ect.. up to 60 sec I believe. I've connected the camera up to my iPad2 and the Apple Connector Kit with the USB connector for the iPad2 and Imported video direct from the camera off the memory card and into the Photos application, and then those show up in the iMovie app I purchased from the Apple App Store. So that's cool. I'm exploring combining a VIO chest harness (available here at BH video) with the google mount for the ContourROAM to see if I can get a shoulder mount parrot camera arrangement, sort of like Captain Jack Sparrow or the Alien in Predator. Posting my progress on the ContourROAM forums if your interested. As for editing the videos, Contour makes a software program called Storyteller available and hosts a website for posting your videos, or you can post them to Youtube. Connecting the camera to a PC doens't require a driver, it just shows up as a memory stick, even labeled with the name of your memory card in the camera. Or you can take the memroy card out and pop another in like film and download/upload later. Every version of Windows has had a version of Movie Maker and that can be used to edit the video and add visual and audio effects, narration or sound and publish. Every version of OS X has had a version of iMovie and that can be used to edit the video and add visual and audio effects, narration or sound and shared. The iPad2 (not iPad1) has the iMovie app and it can pretty much do the same, or create movie projects which can be sync'd to OS X later and further tweaked. Same app works on iPhone. The Android has the Video Editor app on some Samsung phones and its very much like all these other apps for the Windows or OS X platforms. Movie maker is suppose to become available on Ice Cream Sandwich if you get a phone that has that.. Android is a little behind in the video department.. although Samsung does a good job of furthering it along. As for power, I also purchased an i.Sound 16,000 mA battery and I'll review that elsewhere on BH video later. Rated 5 out of 5 by dont from Contour Roam This is the POV camera I wanted, it is excellent. So simple to use, charge the battery, insert your Micro SD card, slide the record switch forward and you are making movies, its that simple! I have not found a down side yet, I recorded a fair amount of my trip to New York with this little camera, so so easy! I have also mounted it to an old push bike helmet and have started recording my RC glider flights. The colour is excellent and full 1080HD video quality. This truly is a great little, easy to use camera, and the download software works! Rated 4 out of 5 by Mexicobob from I would recomend this to everyone. I use this with a RAM mount on both of my motorcycles. It has excelent video quality and a wide angle view. I really like the fact that it can use the same USB connector for charging that my Garmin GPS and Sandisk Clip+ MP3 player use. The 8hr capacity with a 32 gb hsd card is more than enough for anything I will ever need. The 3.5 hour run time on a single charge is sufficent for 99% of the uses that I need, plus I can recharge on the go with the above mentioned USB charge cable. I just need to buy some more helment mounts. The suction cup mount will not stick to my dash on my pickup. Rated 4 out of 5 by Mark from Amazing for the size Excellent little camera. Very easy to use. Picture quality isn't quite as good as the GoPro, but the configuration is easier to work with. We've used it on several projects already, and clients have been thrilled. Rated 4 out of 5 by PSNYC from Decent Image but a Great Deal NOW It is good enough video but nothing fantastic. For a little over $ and fool proof operation via the laser level and on/off switch.I use it to record my bike commutes in case I am struck by a crazy or distracted driver or a ipodded up pedestrian steps blindly into the bike lane wihtout looking.It is my insurance and lawsuit video camera-a good enough for proof camera in short.I wish it were a little sharper. I wish it had 60fps at 1080p instead of 30fps. I also wish it worked better in lowlight. But hey again it is a little over $ USD and easy to use.It works for me. Rated 5 out of 5 by Ndorphine from Ready to shoot anywhere I was deciding between this and GoPro and after a month of use I must say I am happy with the choice. The shape is very ergonomical, easy to carry around, and shoot from your hand or clip using the accessory. Very good in lowlight, the colours, sharpness are great. Setting cannot be changed directly but I actually never needed to change any of the settings after the initial setup. Works great in any light conditions and underwater too, just don't dive to deep. Rated 5 out of 5 by Gregory from Sick Camera! While it is waterproof to 1m, I suggest the waterproof case! Otherwise this camera is going to be amazing this winter! The movie app provided by contour is a little buggy!